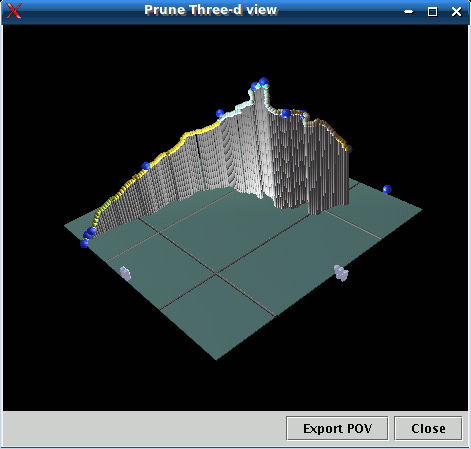 This page shows screenshots from previous versions of Prune. 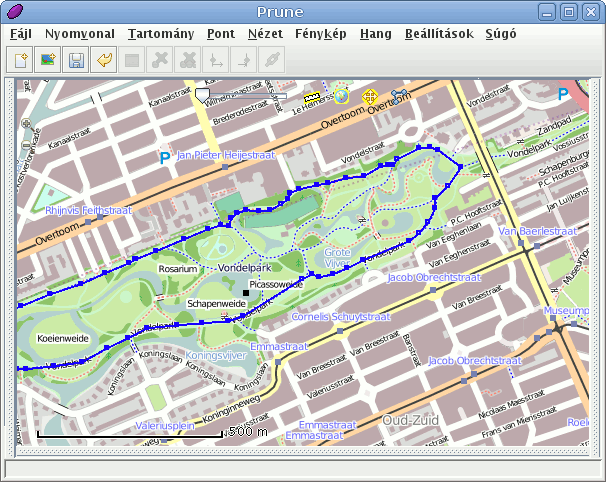 Screenshots of the current version of Prune are given in the current screenshots page. The main layout hasn't changed very significantly since version 10, so here are just a few examples. 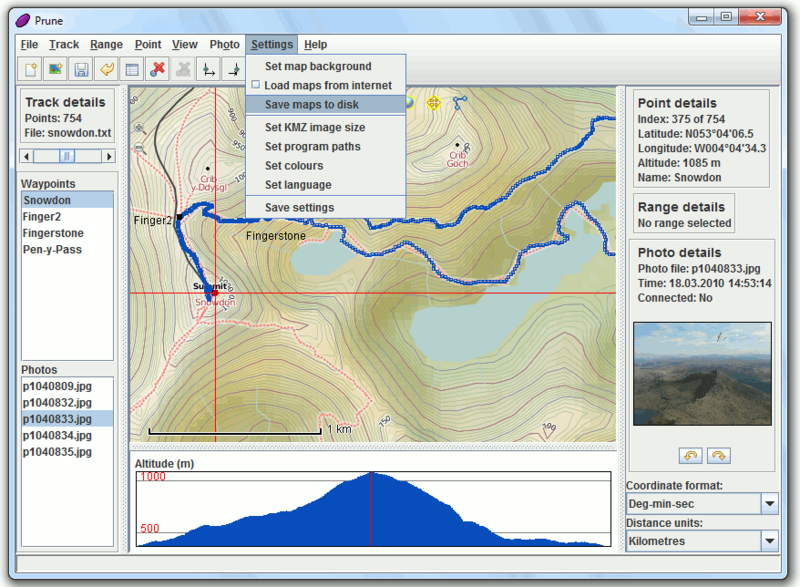 The following screenshots show examples from version 10, from May 2010. 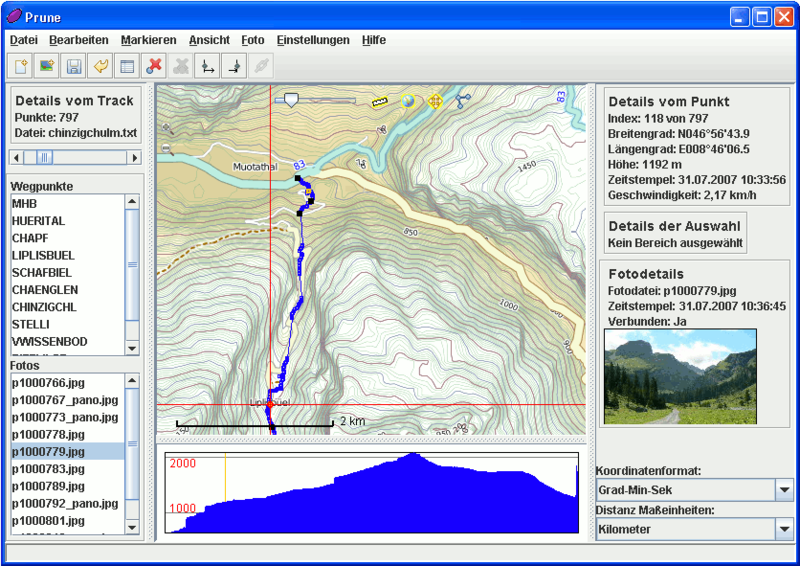 The basic screen, shown here under Debian Linux, with the menu and toolbar at the top, controls on the left, information on the right, the main map in the middle, and the altitude profile bottom-middle. 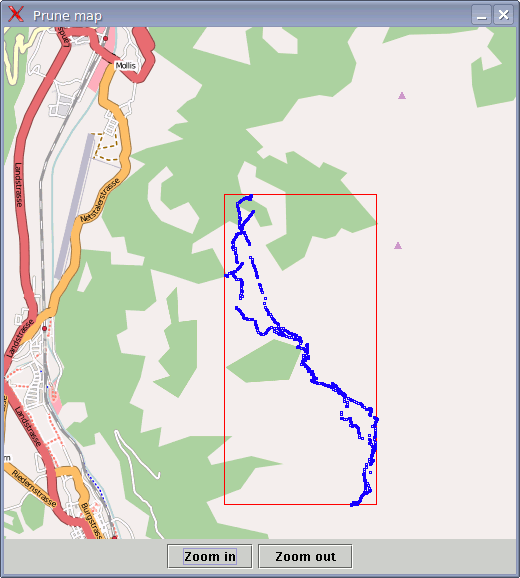 The map images come from opencyclemap.org and show contour lines as well as footpaths. A photo has been loaded but not yet correlated with the track. 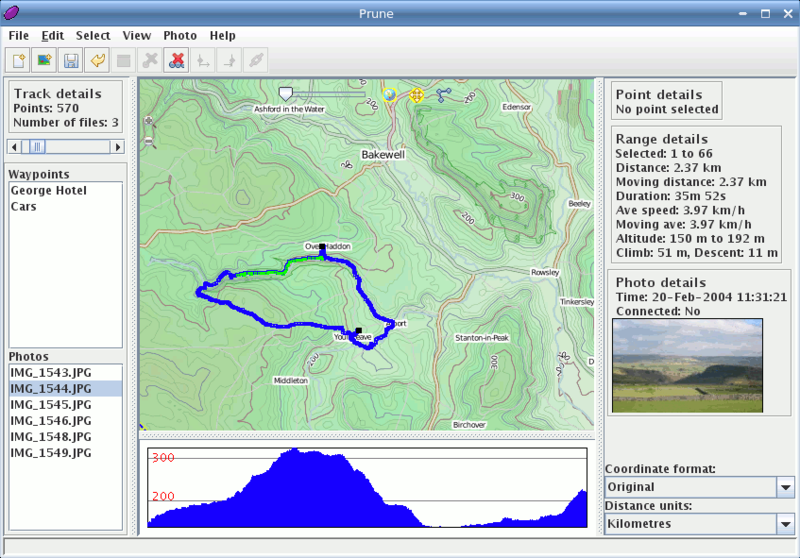 Prune running on an Apple laptop, using maps from cloudmade. Note that the menubar is not in the window, it's been moved to the top of the screen. Prune on Elive, with the language set to Polish. 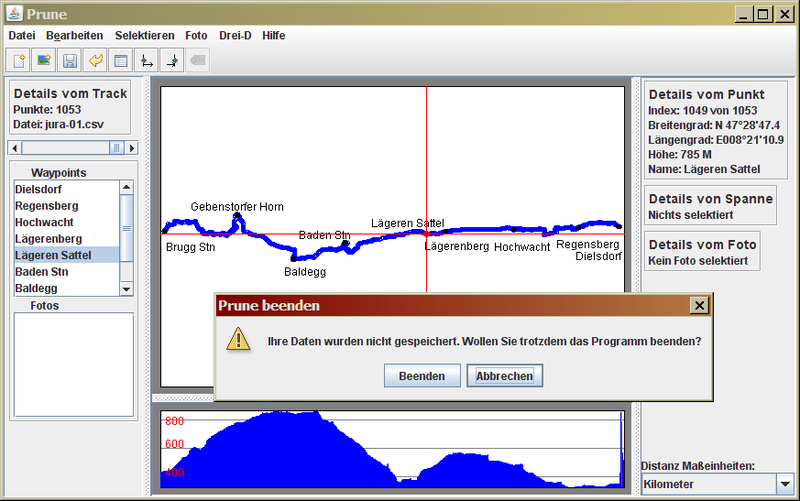 Prune on Microsoft XP, with the language set to German. The view at the bottom is set to show speeds rather than altitudes. 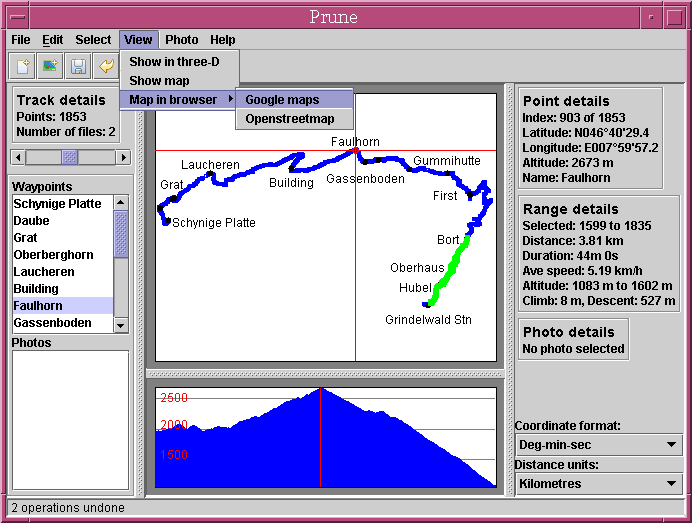 Prune on Ubuntu Lucid Lynx, using the Debian package of Prune 10. 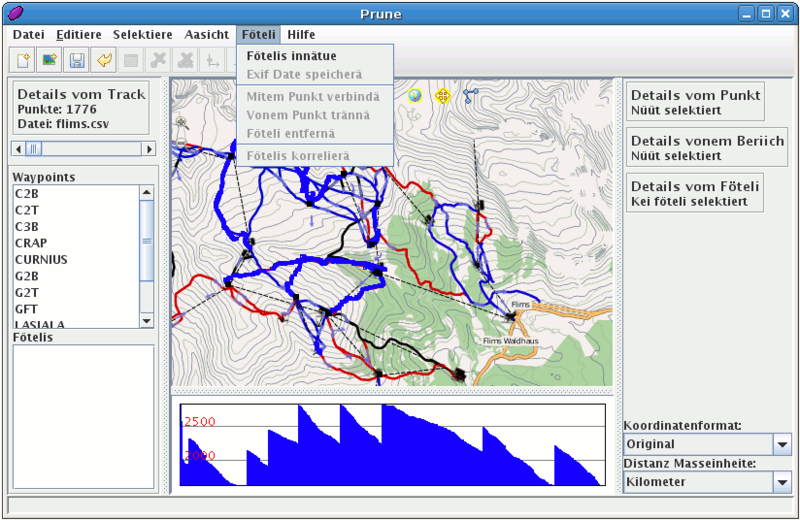 The language is set to Swiss German and the maps of the Swiss ski resort are from openpistemap.org. The java runtime is OpenJDK. Prune on Microsoft Windows 7, showing a hike on Snowdon in Britain. 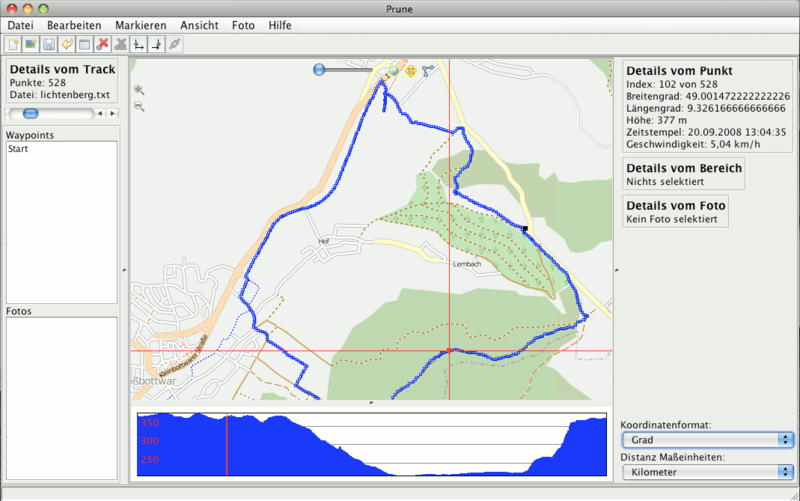 The maps are again from opencyclemap. 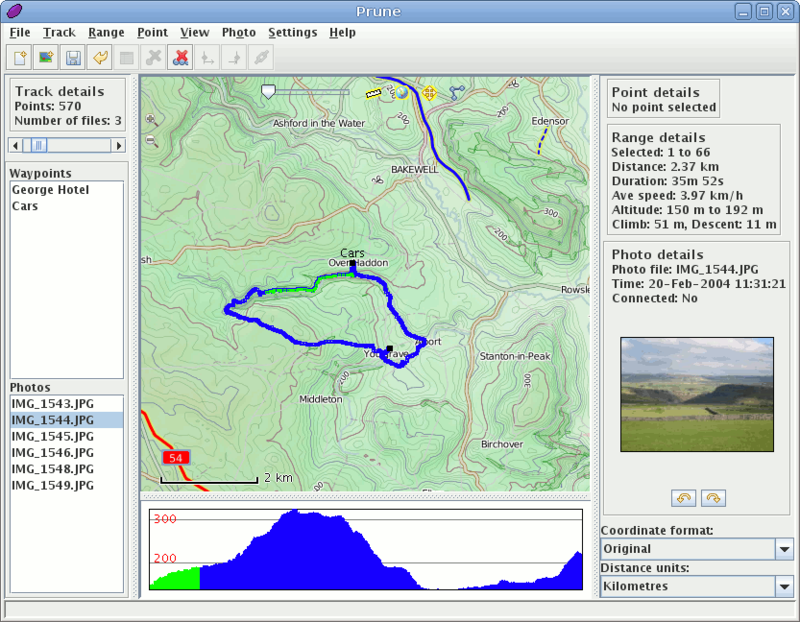 The following screenshots show examples from version 9, from February 2010. 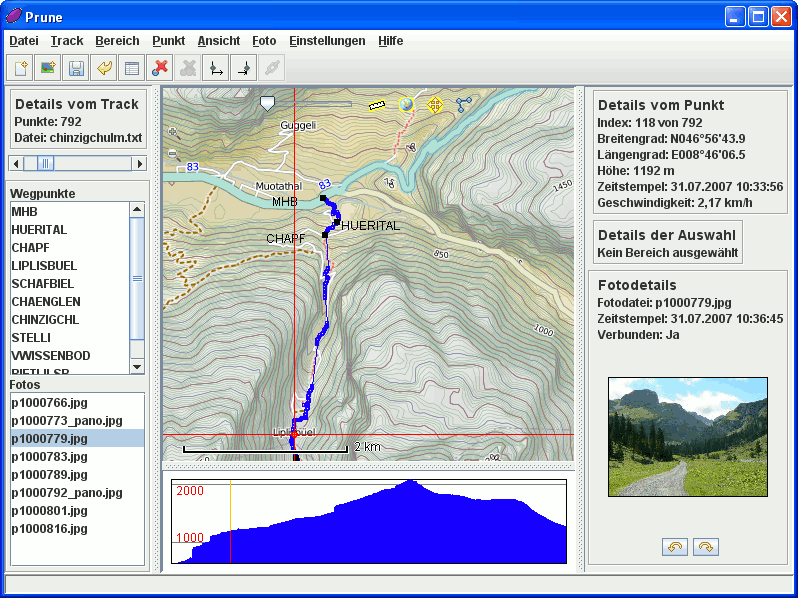 A Microsoft 7 system in German, using opencyclemap images with contour lines. 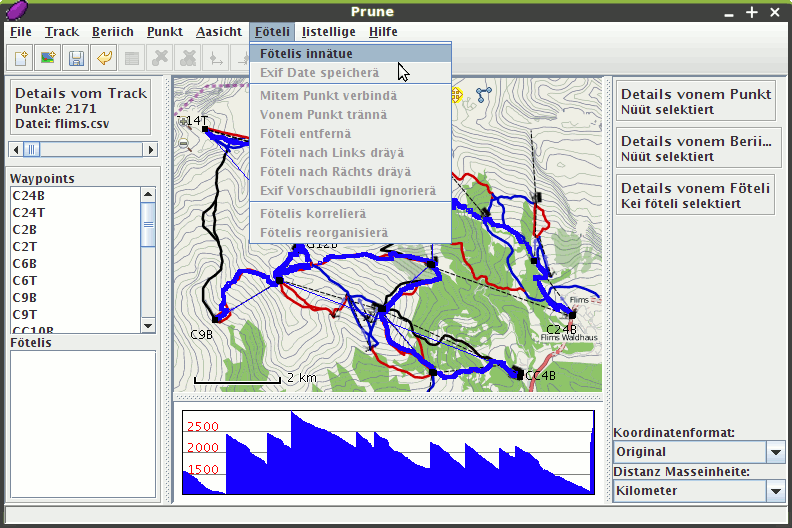 Linux Mint showing tracks from snowboarding in Switzerland, overlaid on maps from openpistemap. 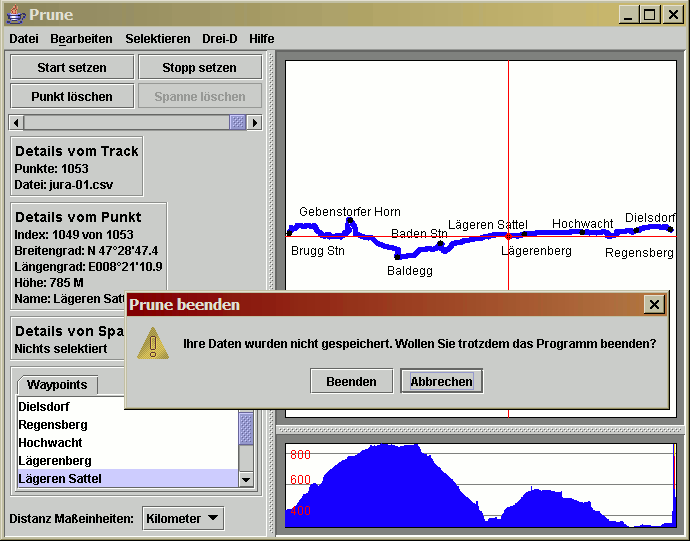 The interface is set to Swiss German. 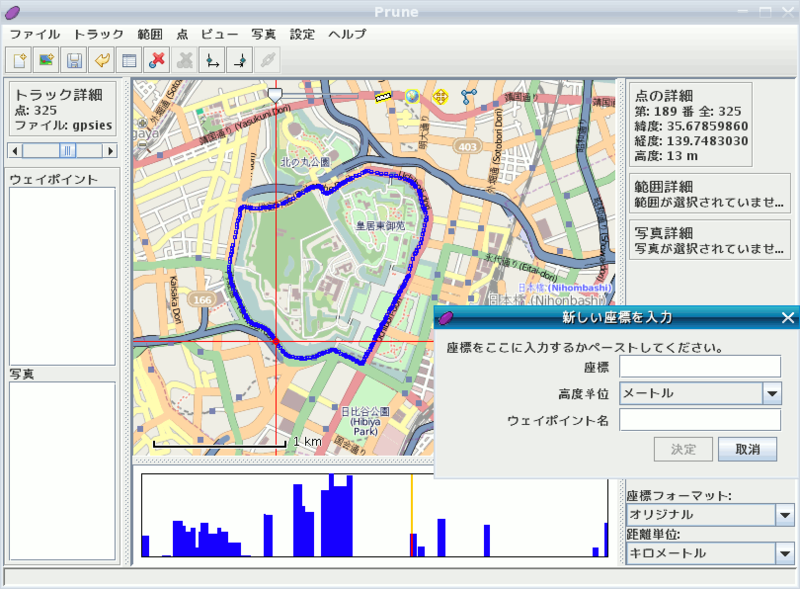 Prune on Mandriva Linux using the new Japanese translations. 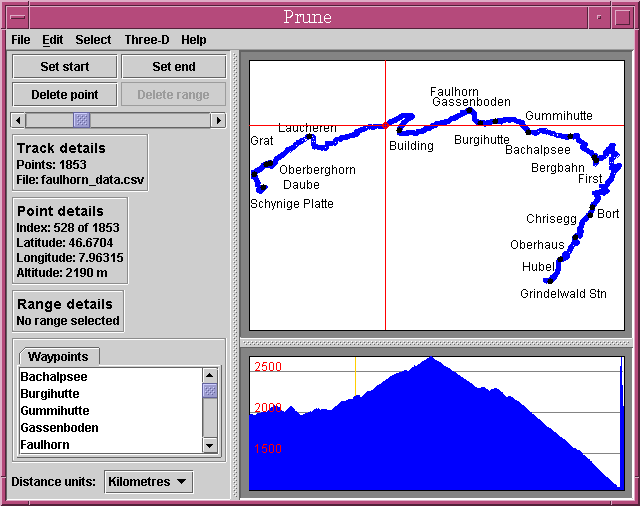 Prune on Microsoft XP showing a Swiss hike. 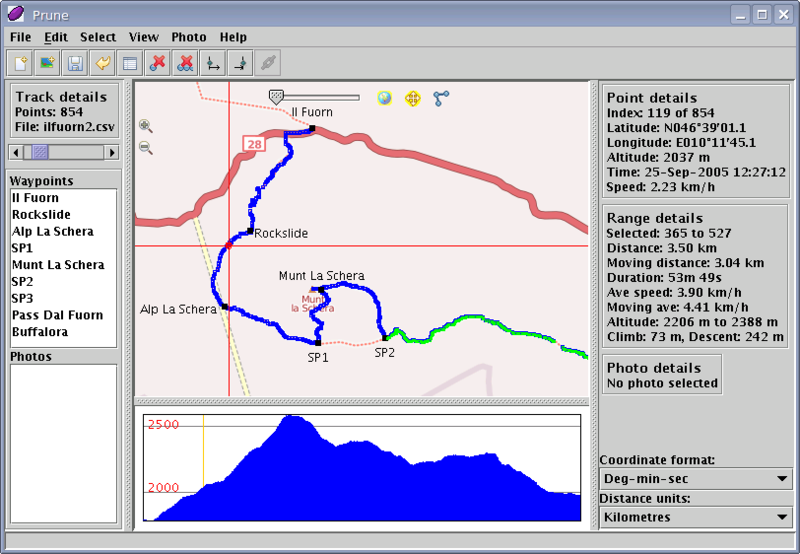 The following screenshots show examples from version 8, from September 2009. 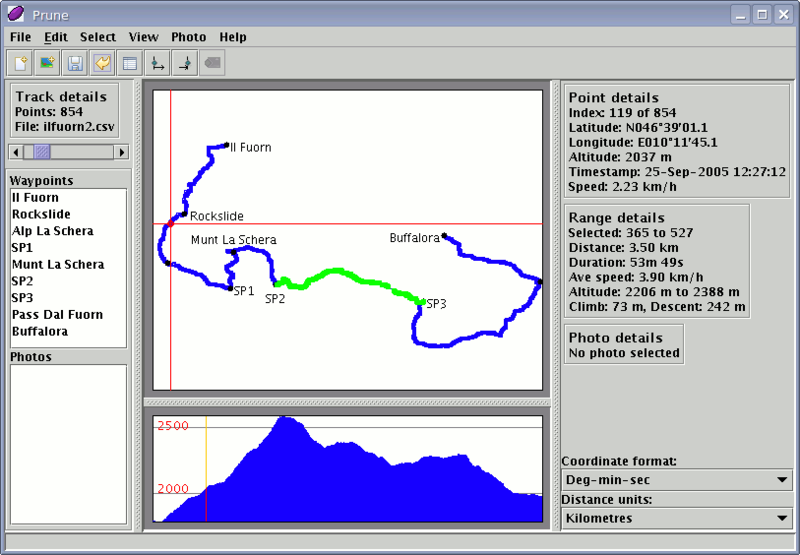 The basic screen, shown here under Linux, with the menu and toolbar at the top, controls on the left, information on the right, the main map in the middle, and the altitude profile bottom-middle. 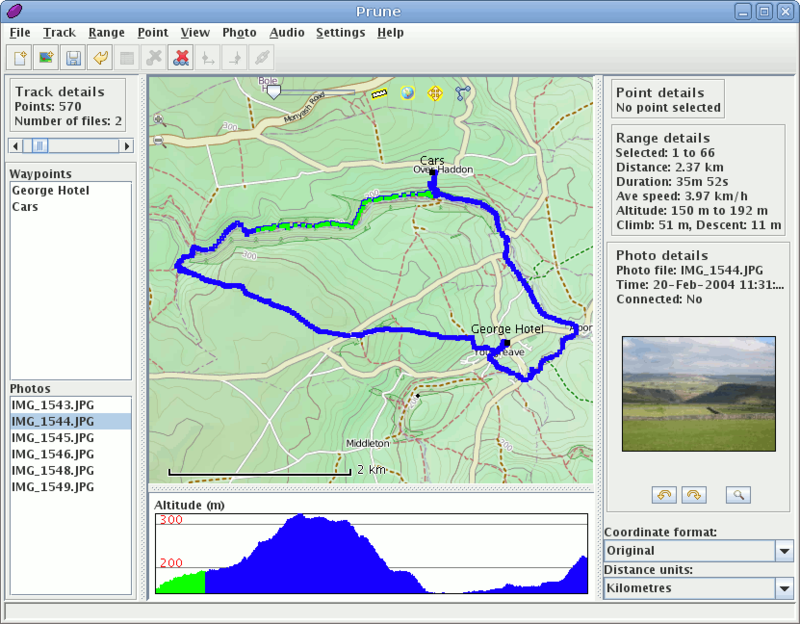 The map images come from opencyclemap.org and show contour lines as well as footpaths. 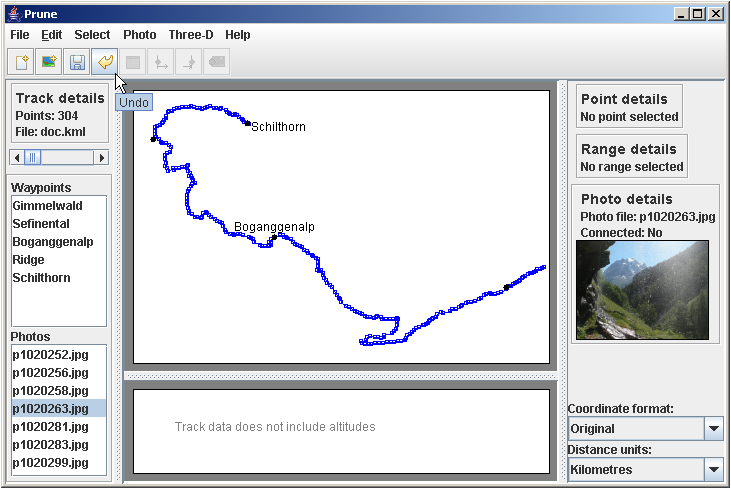 A photo has been loaded but not yet correlated with the track. 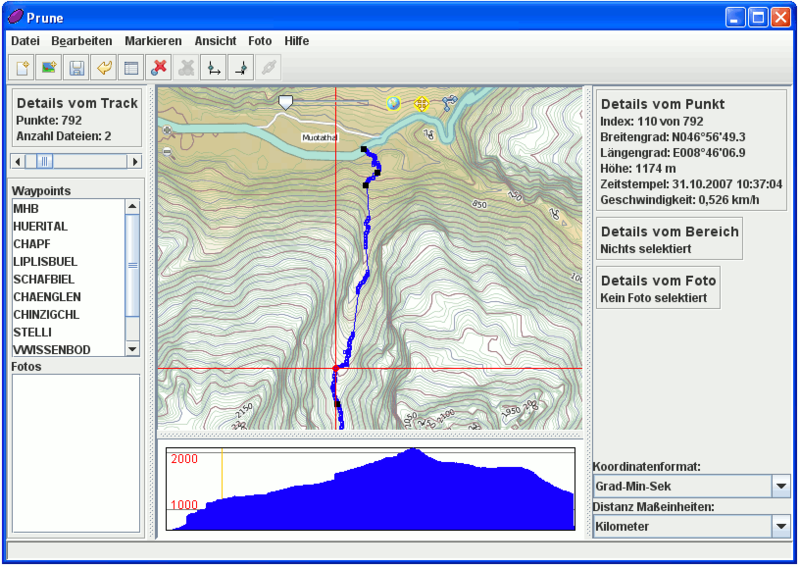 A Microsoft XP system in German showing a hike in Switzerland, using opencyclemap images with contour lines. 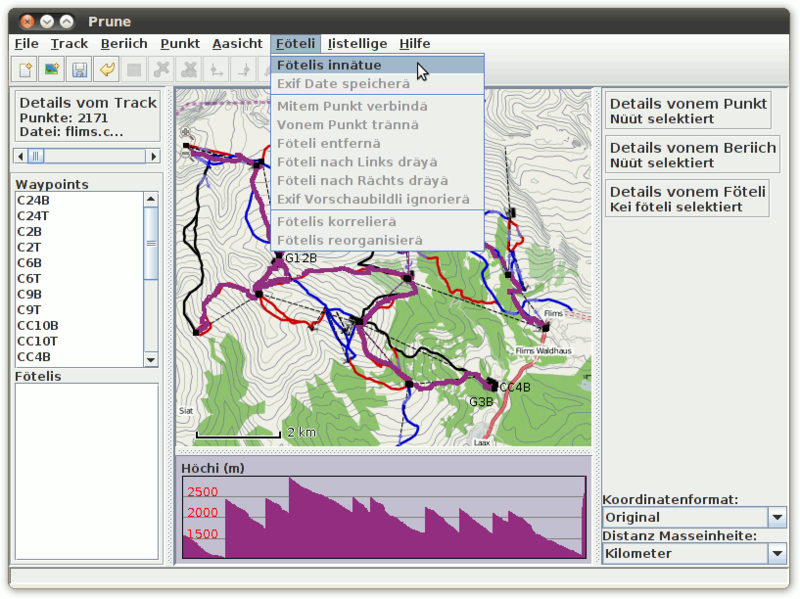 Debian showing tracks from snowboarding in Switzerland, overlaid on maps from openpistemap. The interface is set to Swiss German. 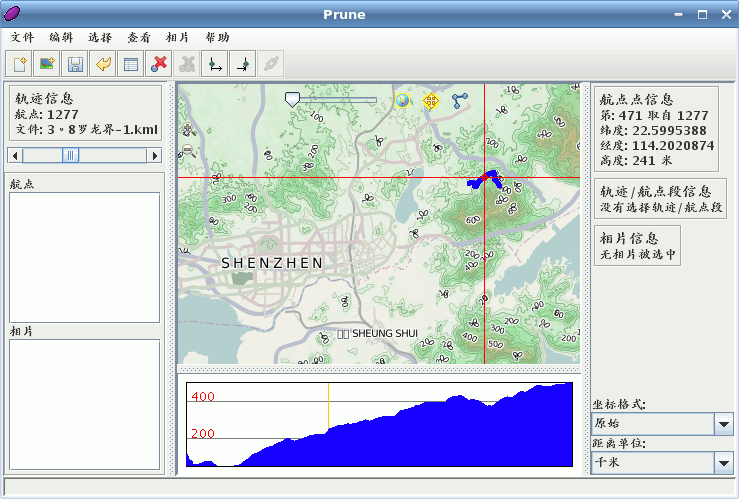 Prune on Mandriva 2010 using the Chinese language pack and Openstreetmap images from China. 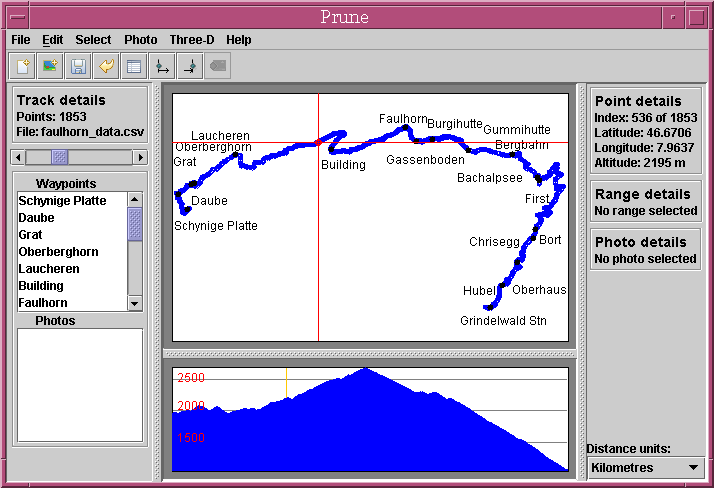 Prune on Microsoft XP using map images from the OSM Reitkarte. 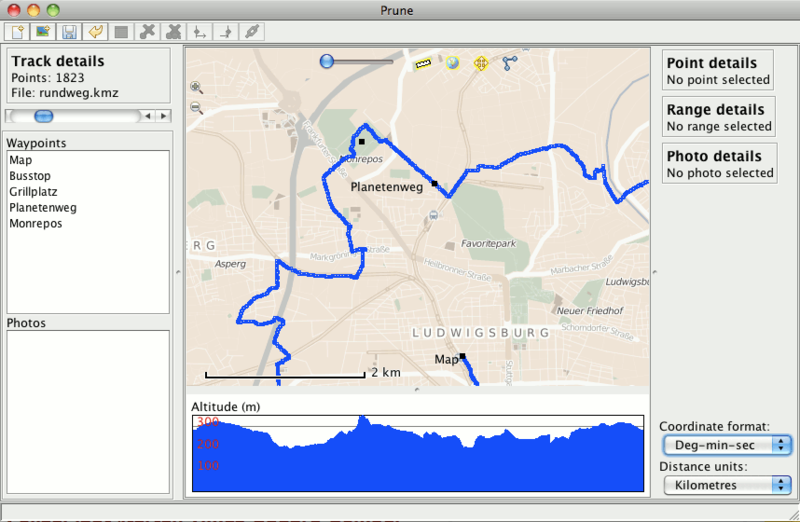 Prune running on Mac OSX, using Openstreetmap images from Germany. 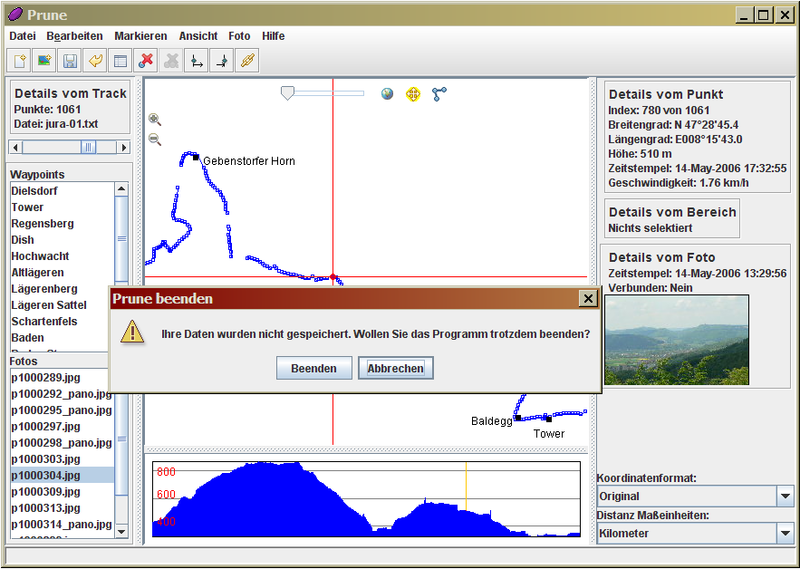 A point is selected and its details are shown on the right, using the German language. 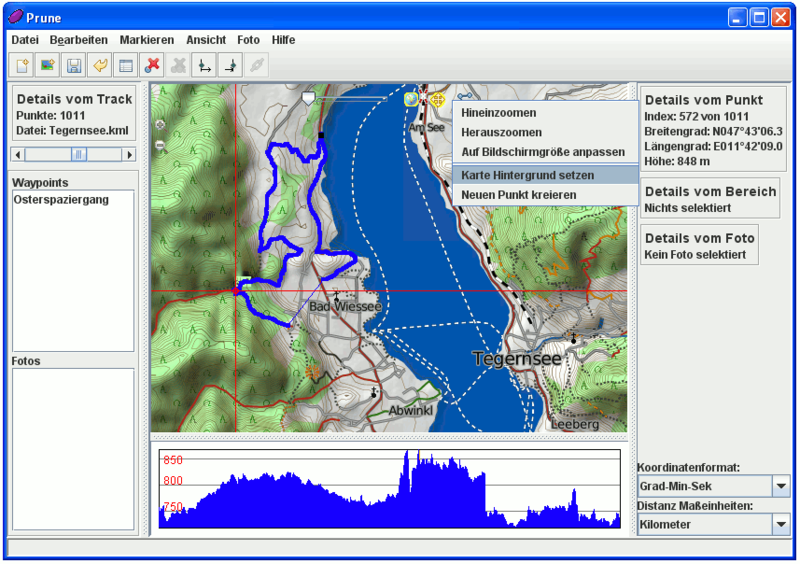 A Microsoft XP system showing a hike in Switzerland, using opencyclemap images with contour lines. 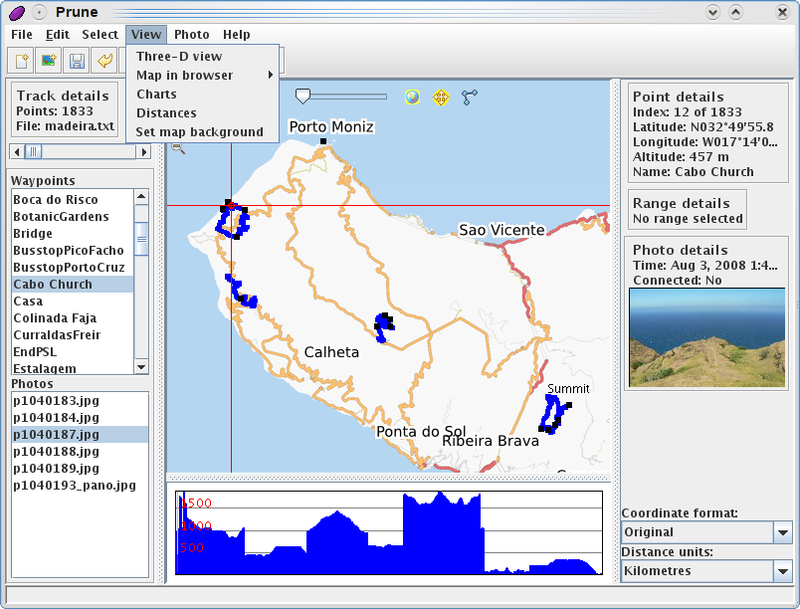 A live version of Suse linux with KDE 4.2, showing tracks on Madeira. 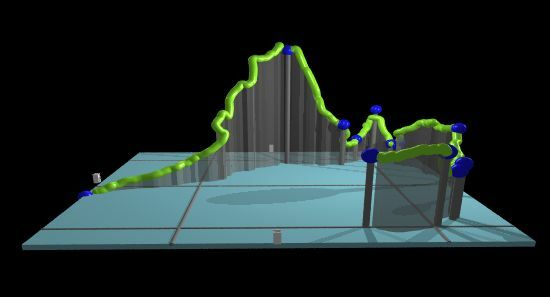 The map images come from the Osma renderer. Photos have also been loaded and the selected one is shown on the right. 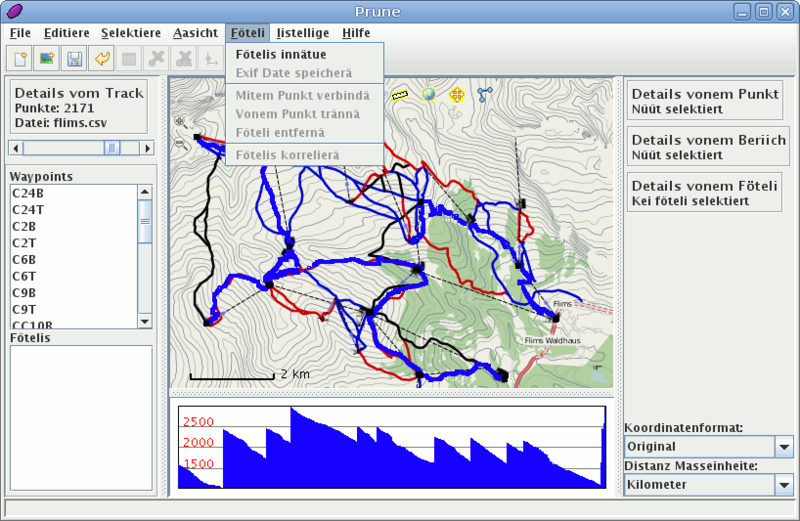 Debian Etch showing tracks from snowboarding in Switzerland, overlaid on maps from openpistemap. The interface is set to Swiss German. 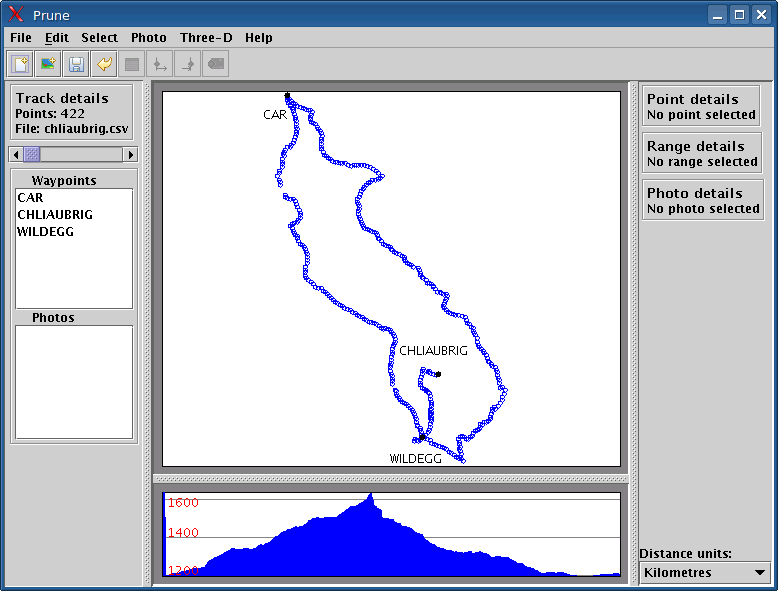 A Microsoft Vista system set to use the Polish language, having loaded a kml file without altitudes. 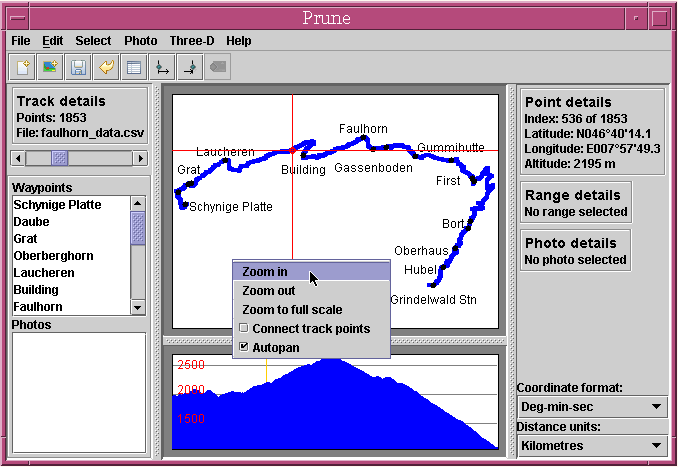 Prune on Microsoft XP showing tiles from the OSM Reitkarte. 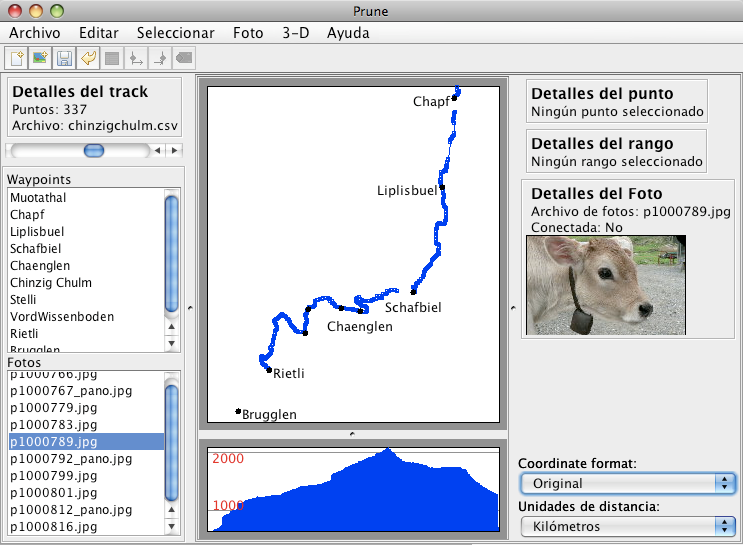 Prune using the Chinese language pack and Opencyclemap images from China. 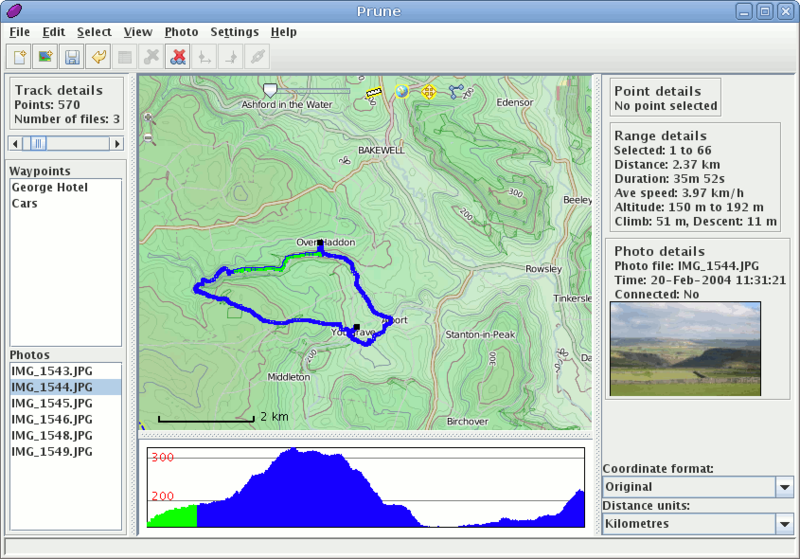 The basic screen, shown here under Linux, with the menu and toolbar at the top, controls on the left, information on the right, the main map in the middle, and the altitude profile bottom-middle. 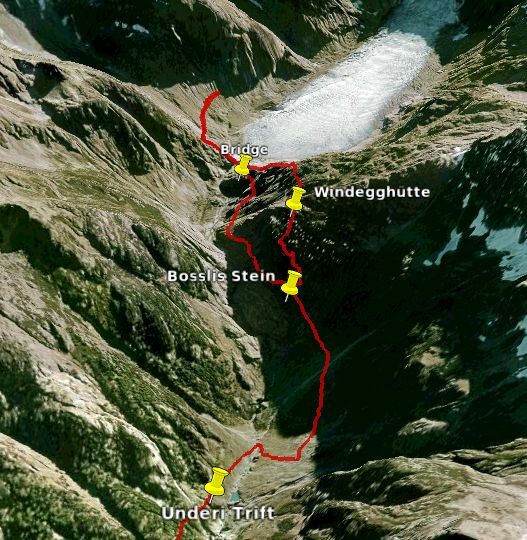 The waypoints are shown as black dots on the map, with their names alongside. The window can of course be resized and the dividers moved. 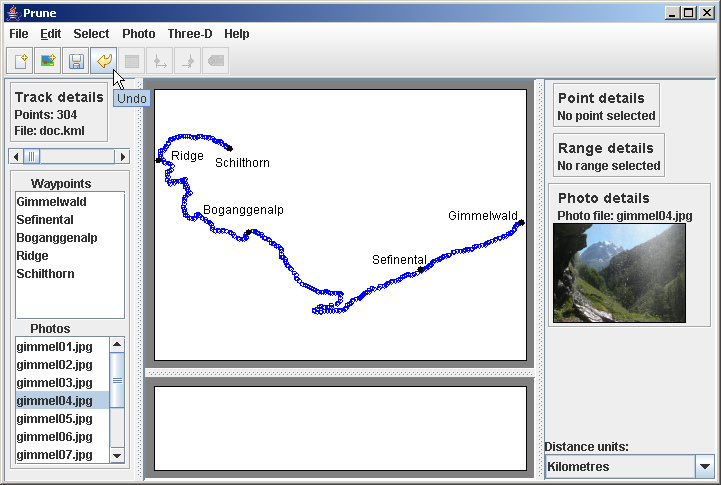 The map images come from openstreetmap.org. 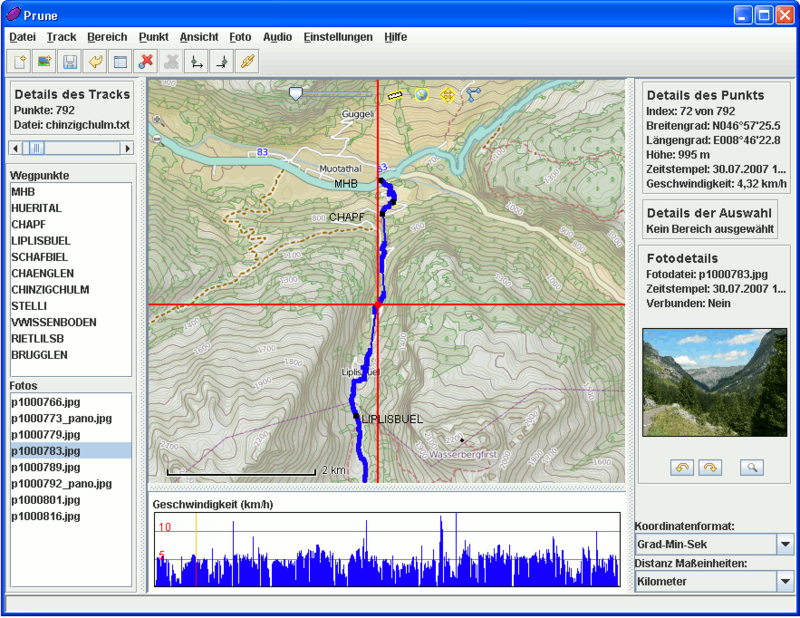 Another linux system but this time set to use German. 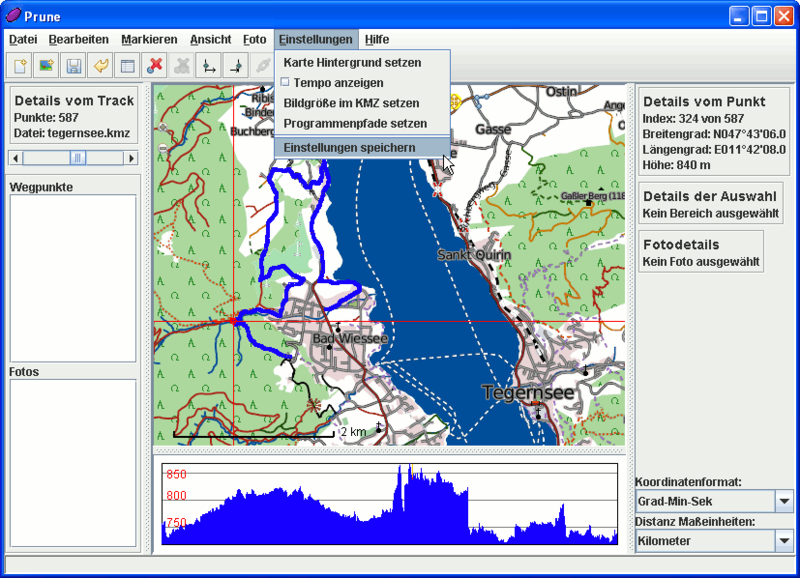 Another linux system showing a coastline hike. 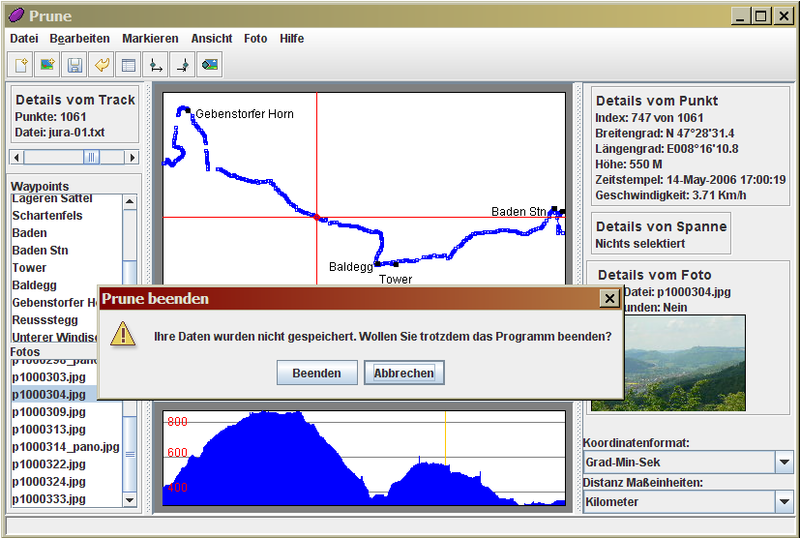 A Windows XP system set to use the German language. All menus, dialogs, buttons and information panels reflect the chosen language. 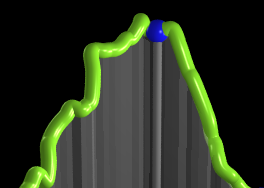 Output from Povray showing zoomed-in detail of the output. The following are grabs from version 5 of Prune, from May 2008. The captions are given below with the corresponding numbers. 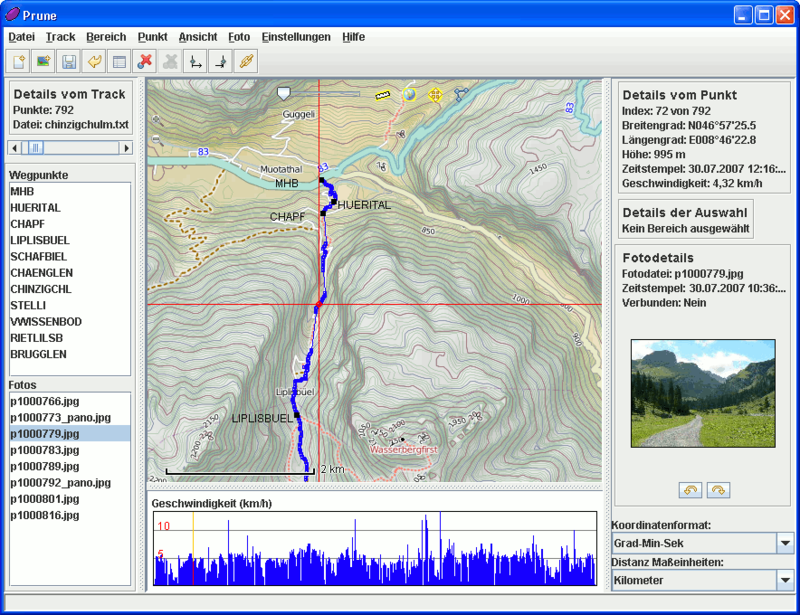 The basic screen, shown here under Linux, with the menu and toolbar at the top, controls on the left, information on the right, the main map in the middle, and the altitude profile bottom-middle. The waypoints are shown as black dots on the map, with their names alongside. The window can of course be resized and the dividers moved. Prune running under Sun Solaris. The range details show average speed, and the statusbar notifies that 2 operations have just been undone. Output from Povray after exporting the data. 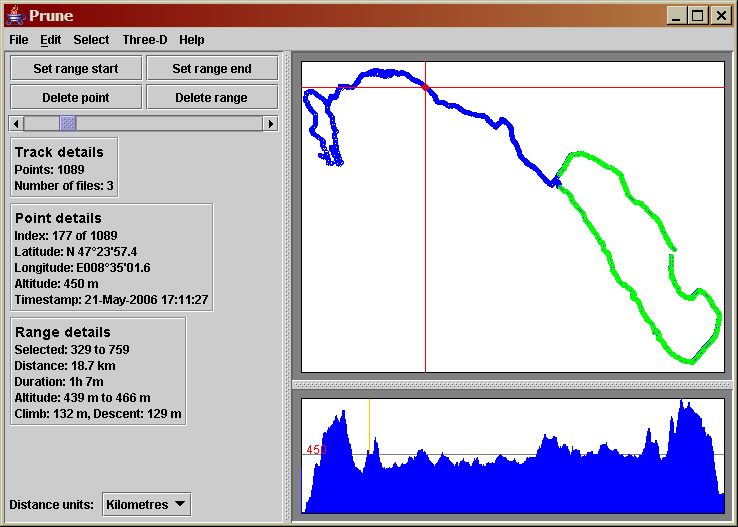 Also shows zoomed-in detail of the output. 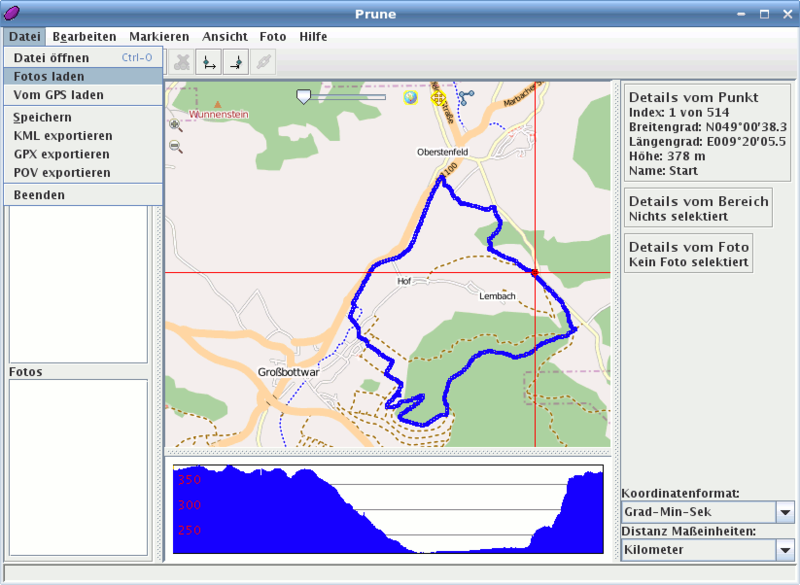 Prune's map window using openstreetmap data. The following are grabs from version 4 of Prune, from January 2008. The captions are given below with the corresponding numbers. 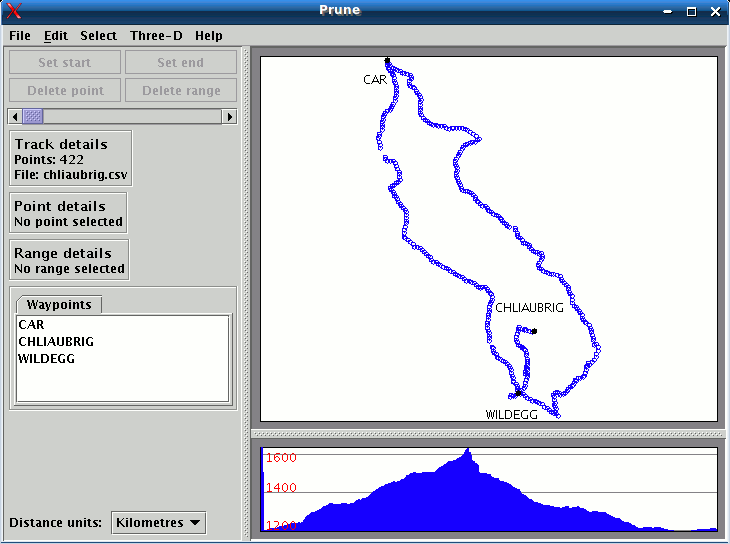 Prune running under Windows XP showing a photo thumbnail. Prune running under Sun Solaris. 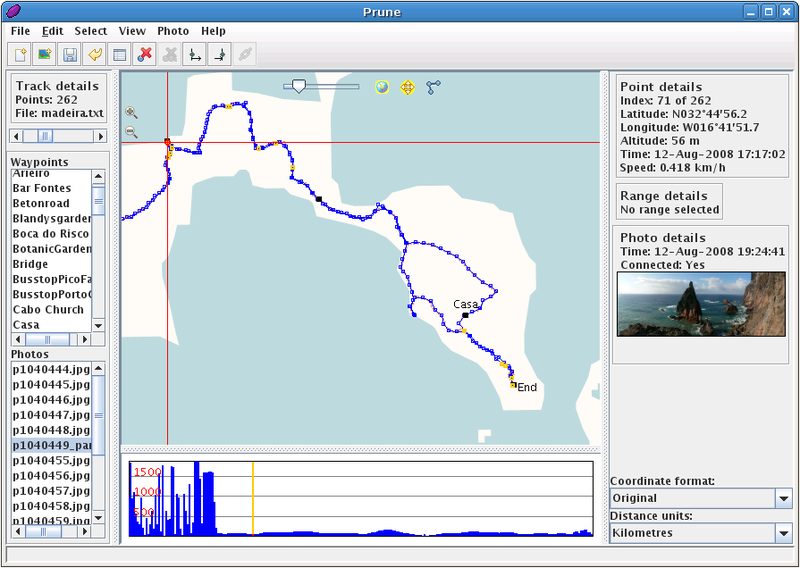 Prune running under Mac OSX. The following are grabs from version 3 of Prune, from August 2007. The captions are given below with the corresponding numbers. The following are grabs from version 2 of Prune, from March 2007. The captions are given below with the corresponding numbers. 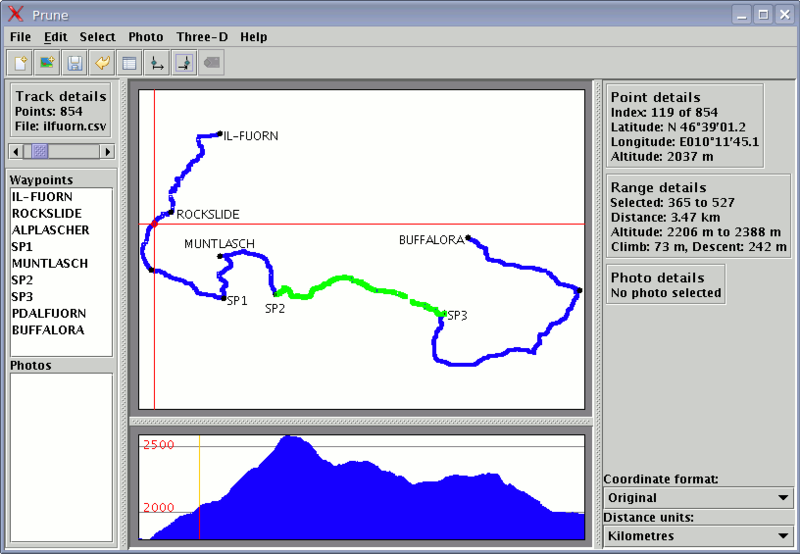 The basic screen, shown here under Linux, with the menu at the top, controls on the left, the main map in the middle-right, and the altitude profile bottom-right. 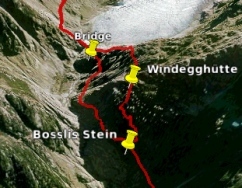 The waypoints are shown as black dots on the map, with their names alongside. The window can of course be resized and the dividers moved. 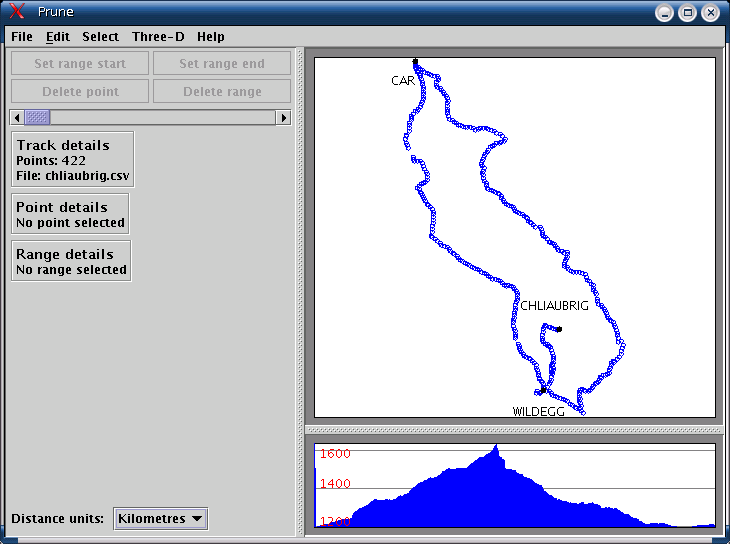 Part of Google Earth's screen showing exported track data. The following are grabs from the very first released version of Prune, from September 2006. The captions are given below with the corresponding numbers. 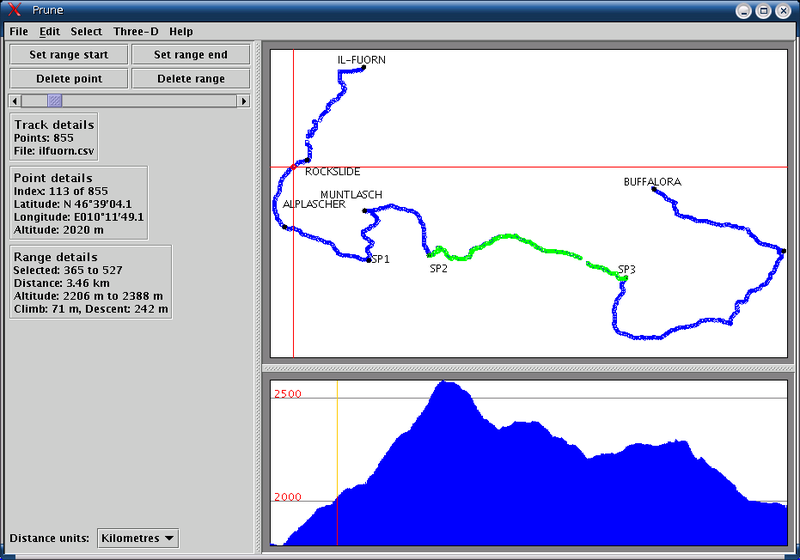 The same screen, but with a point selected (marked by the red cross-hairs, with its details shown on the left panel), and also a range selected (highlighted in green, with its details also shown on the left). The dropdown for "Distance units" determines whether the distance of the selection is shown in kilometers or miles. 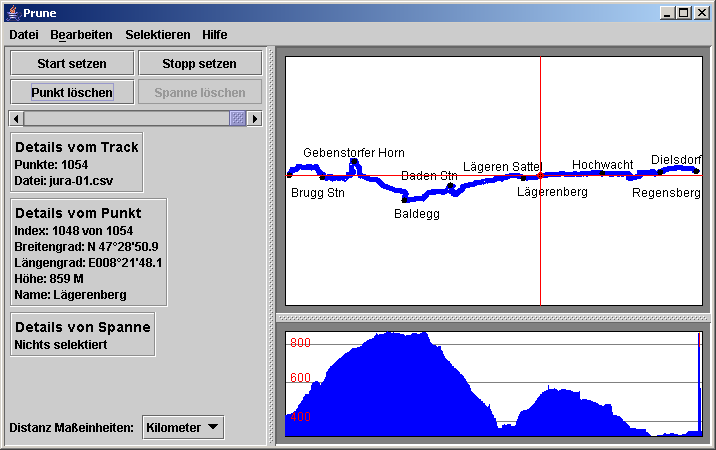 Another example of a track, this time using Windows XP, and displaying a track with timestamp information. 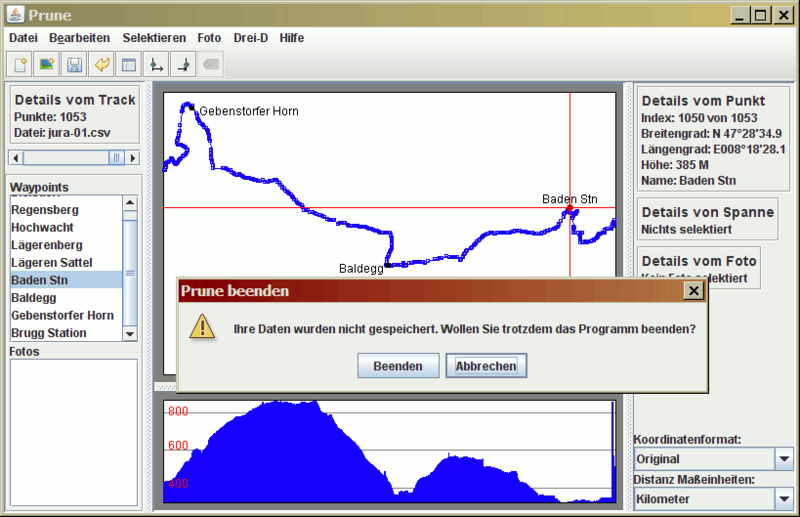 A different machine, also using XP but set to use the German language. 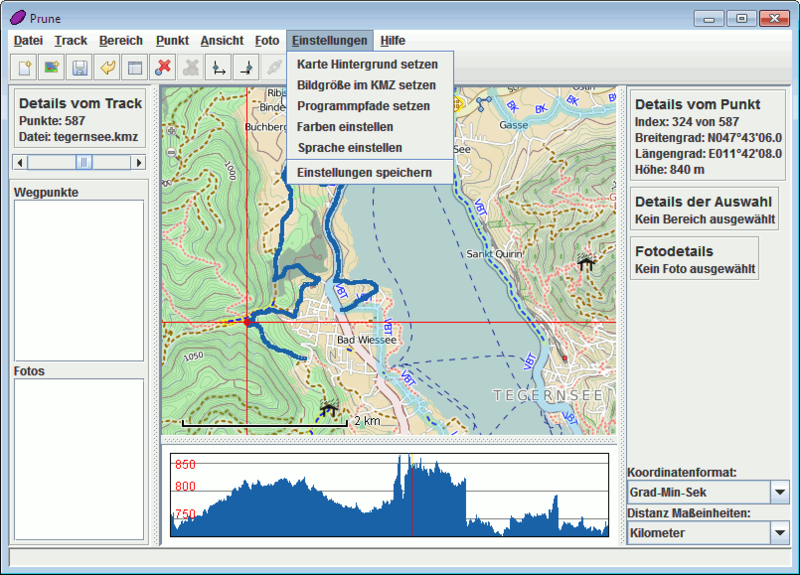 All menus, dialogs, buttons and information panels reflect the chosen language. Page last updated May 2010. Feedback welcome at mail@activityworkshop.net.